The Paintpot was our first product, so called because it resembles a big can of paint. Now in it’s 3rd incarnation, it’s still widely regarded as the most neutral mic amp available. Not bad for a 20 year old design! 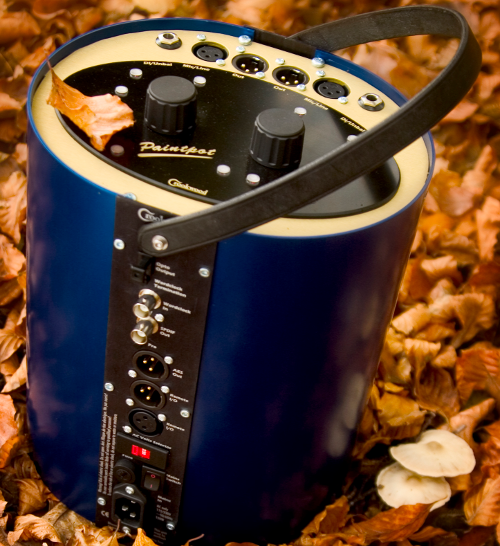 The portable Paintpot, is a neutral 2 channel remote controllable microphone Preamp. It’s based around our original Paintpot pre design, and even 20 years later, it’s hard/ impossible to find a more neutral pre available. It has a host of features to get the best out of any mic, and a wealth of digital output options to make interfacing to your recorder or DAW easy. Optional precision ADC, for optical, coax and balanced digital audio out. All of these elements are digitally controlled and integrated to reduce the audio path to a minimum, but still retain great usability. ADC – the Paintpot already has all of the digital interfacing built in, so with our ADC option, you can get great digital out as well. The ADC is rather special ( see here for more details), and provides you with 44-192K of excellent digital audio output. Remote control – The entire Paintpot can be remotely controlled with the optional remote. This lets you place the Paintpot next to the mics, to reduce their cable length, yet control the levels as if it was right next to you in the control room. Features like presets and session stores make it really easy to use the Paintpot for multiple jobs. Frequency response: -3dB at 3Hz and 300KHz, passively achieved.